Farhad Rostampour and Arshid Moti-Ghavanin landed shortly after 1 pm, on July 18th 2007, at the Donaldson Jet Center. They flew 34000 miles around the globe, landed in 21 countries and made 43 landings in major international airports. Farhad and Arshid became the first Iranian-born pilots to complete a record setting flight around the world in a single engine airplane and the first to start and finish the flight from South Carolina . The flight around the world was complete as the Freedom Flight taxied to the ramp through two giant streams of water that shot over the taxiway by Donaldson Fire Department rescue engines. When we came back there was a TV report from us that they used Iranian current flag in their report and it has done by mistake of the Production team and lack of work from us on Shir O Khorshid (Lion and Sun) flag out side of Iran. Here is the flag that we carry out and that is the only flag we support for Iran and we are against the Islamic Iranian Authority and its crimes against the humanity. No to Isamic Iranian Authority. On June of 2007, Farhad Rostampour, a US based pilot and his UK based co-pilot, Arshid Moti-Ghavanin, attempted a record-breaking around the world flight with a single engine F33TC Bonanza. They are the first Iranians to ever attempt to circle the globe with their aircraft. Farhad Rostampour was born in Tehran, Iran, and moved to the United State nearly 29 years ago. He is the CEO of an environmental corporation. Arshid Moti-Ghavanin was Born in Shiraz, Iran, and moved to the United Kingdom nearly 8 years ago. He is a freelance net marketing director. 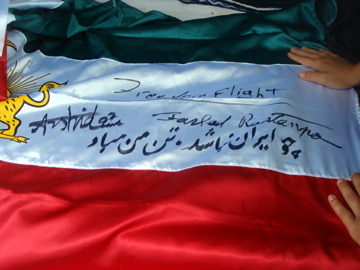 This flight made them the first Iranian-American and the first Iranian-British to take this challenging flight, but for Farhad and Arshid, sharing the freedom of the flight with young Iranians and many other Iranian pilots with a passion to fly, was the greatest accomplishment. They attempted to make the global connection of peace, freedom, hope and achievement through aviation. Farhad and Arshid’s passion for flying goes back to their early childhood. Throughout their journey they were tested for their strength and weaknesses, but they made evrey attempt to overcome the challenges and obsticles facing them during their 46 days of flight around the globe. They wanted to help young Iranians recognize that they too have alternatives and hope for a better future. They carried the book of "Epic of the Kings" (SHAHNAMEH FERDOWSI) in the cockpit of their aircraft. This book was signed by many individuals throughout the international community, regardless of their faith, nationality and political interest.